Happy Thursday, everyone!! Here’s a look at what I wore to church on Sunday. This chiffon pleated skirt is one of my favorites from my clothing line, so flattering and so perfect for twirling! You look so gorgeous! Love the skirt! Perfect as always ! Love the skirt and the color. ? That pleated skirt is seriously gorgeous! That would be perfect to wear around the holidays! Looking so beautiful, elegant and enchanting in this outfit! I like your skirt very much! Love the sleeve detail on the sweater! And I totally need that skirt. I’ve been so obsessed with everything Bordeaux this season and that midi is just perfect! Love this skirt and the top you paired with it. The sleeves are amazing! I am obsessed with this color combo and the sleeves of that sweater! Love this gorgeous look! The sweater and skirt are both gorgeous! You look stunning and soooooooo tan! I love that sweater! Such a fun look! Beautiful skirt! I love this outfit so much! It’s so feminine and beautiful! Why do you never update your “Shop my Instagram” page? You wear such great looks on your Instagram that you don’t post on your blog, yet you never seem to update this page. I wish you would do this. Wow, your outfit is just AMAZING!!! Love everything in this outfit!!! The sweater is so pretty and the skirt too. Well done, Rach! I love the contrast of the different textures!! I love this!! That skirt is perfect for the fall and upcoming holidays!! You look absolutely gorgeous, Rach! I love that sweater, it’s so beautiful and looks great paired with the pleated skirt! Thanks so much for sharing and I hope you’re having a great week so far! Love the top and skirt!! I love that skirt from your line so much! It’s on my christmas list. I love the way you paired it with a sweater. You look lovely! Thank you Lauren! It is one of my favorites for sure! Love how you matched this look!!! That skirt is stunning! I’m obsessed! I love the sweatr and the skirt!Adorable! You look beautiful! Love your skirt! What a darling look for Christmas! I love it! One of your best outfits I must say! I adore this sweater! LOVE LOVE LOVE! 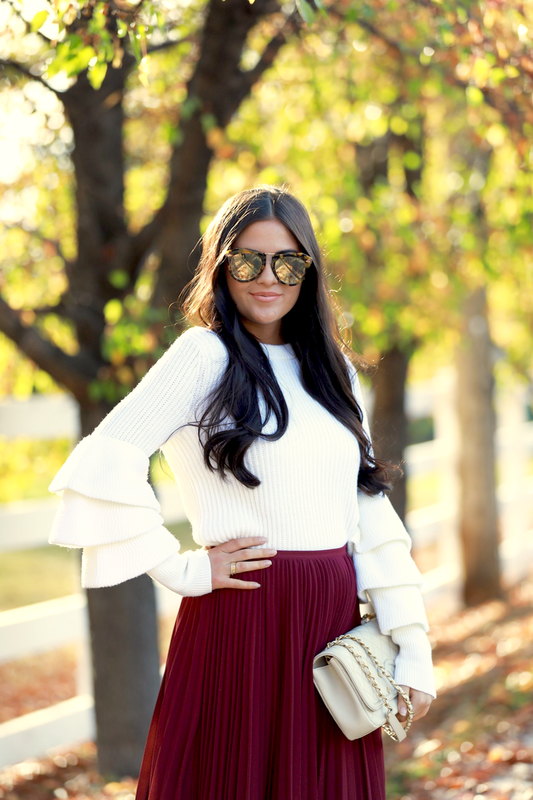 this adorable sweater and the beautiful, burgundy skirt are just a perfect match!!! :) love this look! Such a pretty pleated skirt! Love the feminine shape and color! 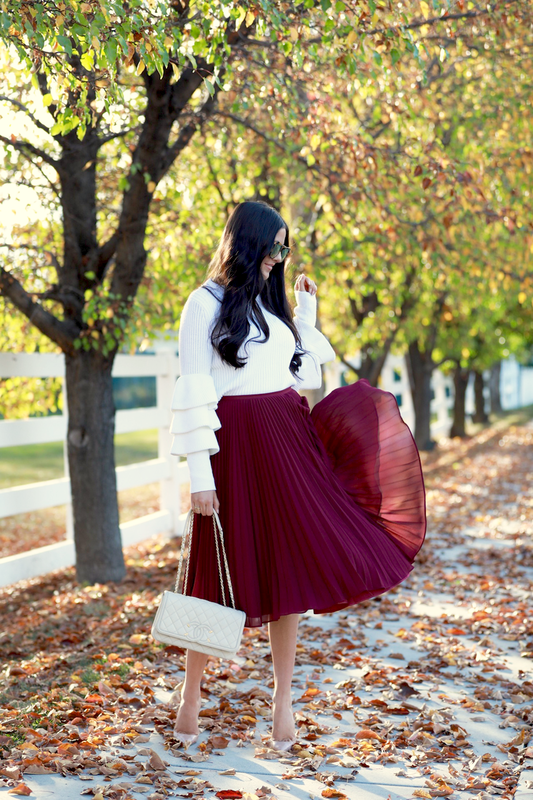 Loving color of that burgundy skirt! That skirt is just perfection for the holiday season coming up! The skirt is ver beautiful and i love the shoes! Stunning as usual! Have a great day! I absolutely love this skirt Rach. You look gorgeous! HI Rachel I love the whole outfit. I am curious for the sweater which size you went with or would recommend?